A young foal is a joy to behold as it gains control of its wobbly legs and nuzzles its mother. Given proper care and training, that young foal can become a joy forever as he advances through the years and stages of life from foal to senior horse. The first few months of the foal's life are critically important. Needless to say, the first few months of the foal's life are vastly important in training the foal to live in both human and equine society. Beginning at a week or two of age, the foal should become used to being handled and groomed. Since most of the foal's time is spent napping, nursing and playing, training sessions should be brief and not cause distress for either the foal or the mare. Most of the handling and training is part of routine care. Picking up and holding each foot, then putting it down again several times a day teaches the foal to accept handling of the feet and also helps it learn balance. This is invaluable preparation for future contact with the veterinarian and farrier because the young horse will not become alarmed when its hooves and feet are trimmed, fitted with shoes or treated for disease or damage. Foals are physically awkward and curious about their surroundings. 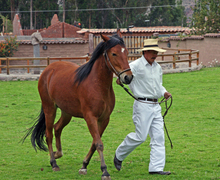 A small, soft halter can be put on the foal to begin teaching it to lead and walk quietly beside its handler. The halter should be removed when you are not present to prevent the straps from becoming a hazard that could entangle the foal. Learning to follow directions is one of the most important behaviors to teach a young foal. Foals are physically awkward and curious about their surroundings. They will play until they are tired and then lie down to take a nap before starting up again. 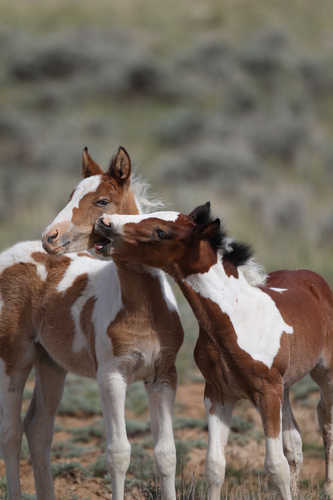 When play time involves other foals or horses, it takes on added dimensions in helping the foal become socialized by watching and mimicking other horses while interacting with and learning from them. Foals should not be allowed to nibble on people, strike out or kick. As the foal grows and becomes stronger, these actions can become dangerous. A quick, forceful notice to stop a behavior will leave a lasting impression on the young foal. The most effective punishment for misbehavior on the part of the foal is one that is meant to stop a behavior that, if left unchecked, could turn into a bad habit. Often, a pop on the nose of the foal of a foal that is misbehaving, while you vocally express your displeasure will let him know that certain kinds of behavior are not acceptable. To be effective, this physical and verbal discipline must be consistent and firm to turn it into a true learning experience for the foal. 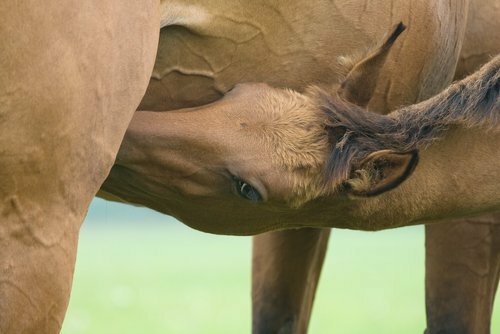 Most foals get their nutrition from the mare's milk during the first months of their lives, and they also begin to eat with their mothers during the first few weeks. At this time, the foal should be allowed to eat what it wants. Most foals begin to nibble hay and grain on their own at 1 to 3 weeks of age. Once the foal is approximately three months of age, the growth rate and nutrient requirement usually exceeds the nutrients provided in the mare's milk and the foal will need to have the milk supplemented with 1/2 to 3/4 pounds of high-quality concentrate feed each day per 100 pounds of foal body weight. A creep feeder that lets the foal eat without letting the mare access the feed works well in most situations. If more than one foal is involved, it will be necessary to make sure that overly aggressive foals don't consume all the feed, while the more timid foals are prevented from eating. Be careful not to over-feed your foal, since this can be detrimental to the foal's health and future athletic ability. Also avoid, over supplementation with vitamins and minerals and be careful to read all labels on feed to make sure that a foal doesn't receive too much of any one vitamin or mineral. 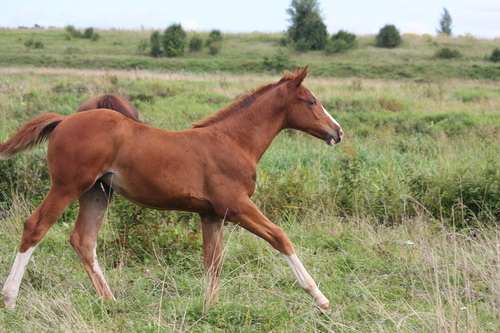 Exercise in a pasture is the best way for a foal to get the workout it needs. If the foal must be kept in a stall or small pen, work with your veterinarian to design an exercise program that will work for your foal. 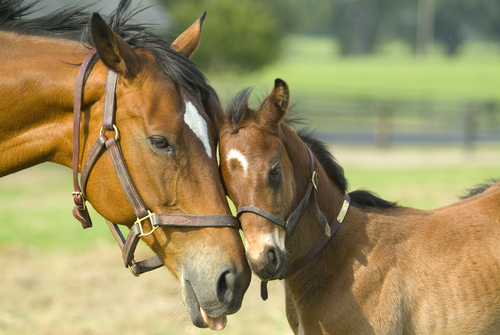 Foals should be given the opportunity to interact with each other and with older horses whenever possible. Continuous, free exercise while in the presence of other foals and horses has been linked, not only to good bone strength and hoof formation, but also to development of healthy attitudes and relationships with both humans and other horses. 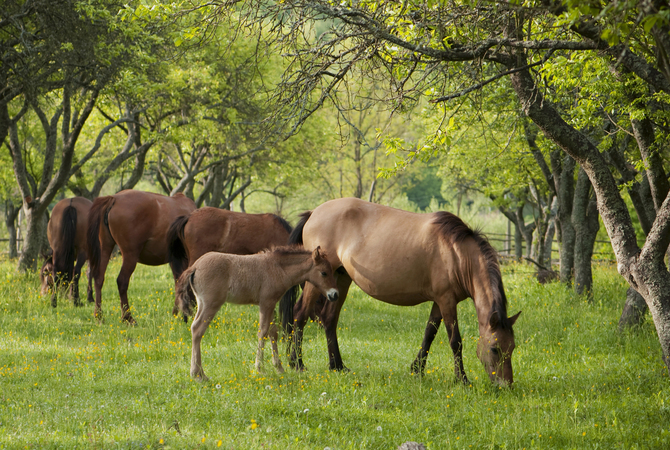 If your foal cannot have free run of a pasture and the company of other horses, choose appropriate levels and kinds of exercise including some lunging and pen work. Never exercise a foal to the point of fatigue. This can be damaging to joints and limbs. A foal needs a clean, safe environment with adequate shelter from the elements. Checking the foal's environment and eliminating any potential hazards such as loose boards, wire fencing, nails, or equipment that might cause injury is also important since foals are naturally curious and may injure themselves in unexpected ways. Weaning is one of the most traumatic events in the life of a foal. The timing will vary depending on the foal and the mare, as well as the circumstances of the owner. By the time a foal is 4 or 5 months old, most willingly leave their mothers for periods of play in the pasture or with other foals. A foals experiences with weaning and other learning situations leave a lasting impression on the foal. The more positive the foal's experiences, the easier the horse will be to handle and train, not only as a yearling and a two-year-old, but for years to come. If foals are familiar with feeding from a creep feeder, weaning is less stressful. One effective way of weaning is to remove the mare from the stall in the morning, taking it out of eyesight and earshot of the foal. The foal is kept in the stall and then put in a familiar pasture on the second day. If you have two or more foals, you may want to put them in a pen and put the mares in an adjacent area separated by a strong, safe fence. This allows the foals and mares to see each other and call to each other and stops the nursing. The key to weaning management with as little stress as possible is training foals to eat well before weaning is initiated. A weanling is a young horse that is no longer getting milk from its mother, but is not yet a year old. During this time, the very young horse is learning how to become a horse. Socialization skills are being learned, and for this, the weanling needs to be around both horses and humans. One of the greatest joys of raising horses is watching the antics of weanlings at play. With the weanling away from its mother, an older quiet horse can serve as a role model. Like foals, weanlings will continue to play until they wear themselves out and will then lie down to sleep. In human terms, weanlings are similar to preteens, and while overcoming much of their awkwardness, continue to need much guidance as they learn about how to interact with other horses and with humans. One behavior that is seen with many weanlings when introducing themselves to older hoses is 'champing' or 'snapping.' The younger horse shows submission by extending its neck and head, and pulling its lips up and back while clapping its teeth up and down as if chewing hard. It appears to be saying, "I'm just a young horse. Help me out here!" By brief daily work-outs with a trainer and careful handling the weaning learns what is expected of it and begins to adapt to the requirements it will meet as it grows older. During the weanling period of rapid growth, too much food can be as bad as too little. Over feeding can cause joint problems and a properly balanced feed should be given if pasture and hay are insufficient to sustain proper growth and weight. A yearling is a colt or filly over the age of one year. Yearlings are nearly always fully weaned and independent of their mothers. They sleep less and spend more of their time standing rather than lying down. Adult characteristics and behaviors emerge during the yearling phase. These young horses will test the boundaries with both herd mates and human handlers. These youngsters are very curious and enjoy mouthing anything they find in their pastures or stalls. Play toys such as balls and other safe items can help satisfy their curiosity. Weanlings play among themselves by play fighting, galloping, bucking, and running with bursts of speed. Even at this young age, care should be taken to keep colts separated from mares in heat. Some colts begin showing an interest in mares at a very young age and some may be able to breed a mare. Many a breeding accident has happened with a colt thought too young to be fertile. Gelding can be done as soon as the testes have descended into the scrotum. If the prime reason for keeping a horse is as a pleasure horse, then the sooner gelding is done the better. A young gelding is much more trainable and easier to deal with than a young stallion that has developed an interest in mares rather than what the handler is telling it to do. During this period, a yearling should be learning to be obedient, to lead quietly, and to stand tied for grooming, vet and farrier work. As the horse approaches its second year, it may learn about the use of bits and may carry a saddle, although a horse under the age of two should not carry any weight. Short training exercises are important, not just for exercise, but also to teach good manners. If the young horse is going to be involved with carts and harnesses, now is the time to introduce them. Most horses at around age two are beginning to learn how to hold a bit and carry a saddle, although actual riding is usually put off until the horse is around 3 or 4 years old. Light training normally begins at the age of two. While not yet physically mature, most experts agree that the two year old benefits both physically and mentally from training at this age. A two year old's joints are still maturing and are susceptible to overwork. Joints throughout the limbs mature at different rates. While the legs may be strong and mature, the hips and back may not. Although many thoroughbreds race as two year olds, other breeds take longer to mature and gain full strength. At age two, most horses begin to mature sexually and young stallions may become aggressive. Most mares are sexually mature between their first and third year depending on the environment. Mares and stallions should have outstanding qualities and should prove their worth before being considered for breeding stock. Only horses with outstanding conformation, performance and temperament should be considered as breeding stock. Allowing a horse to breed simply to have a foal is a questionable practice and results in a supply of unwanted horses. A properly trained two year old will have excellent ground manners and will have learned to be cooperative when loading into a trailer. A two year old can be lunged, round penned, driven hitched to a light vehicle and ridden at the owner's discretion. Between the ages of two and five, the young horse will continue to become stronger and more mature both mentally and physically, and will be able to carry more weight and develop skills related to the horse's work whether competitive or as a pleasure and farm horse. 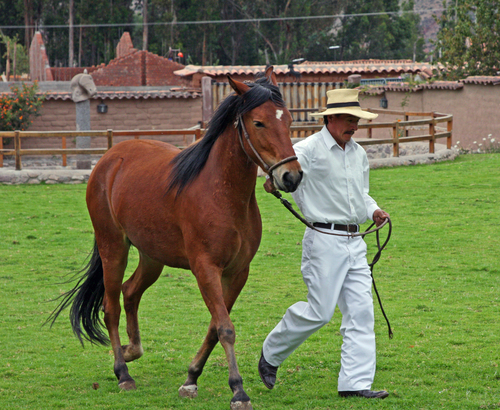 This is the horse's peak learning phase and the bulk of the horse's training usually takes place between ages 3 and 6. The human equivalent to this age group is the late teens to early 20's. The horse is now ready to begin taking on serious work and is now capable of becoming a great companion. Horses are in their prime working years between ages six to fifteen. All bones and joints are fully developed and the animal is considered mature. By now, the horse has learned how to respond to humans and is ready to take on a full load of the work it was bred for, whether pleasure horse or in the competitive arena. 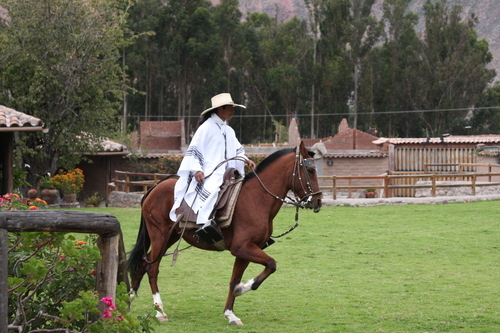 Physical and mental maturity allow the horse to become active in trail riding, showing, ranching and other demanding endeavors. Horses at these ages are good companions for novice riders provided they don't have too much energy. They can be very engaging and show appreciation for treats, praise, and caresses. Training and exercise continue at a high level during these years. Even now, every interaction with a human leaves an impression on the horse making it important to continue with appropriate feeding, training and handling geared to keep the horse in tip-top shape both mentally and physically. For those familiar with the stories of Charles Dickens, one of the most delightful characters is the Aged Parent in Great Expectations. Somewhat frail and needing a little help here and there, the aged parent of Wemmick exhibits many of the characteristics of a senior horse. The same delight in everyday schedules and the opportunity to interact with people and other horses can be seen in many aged horses. Aged horses continue to enjoy treats and special attention along with adequate exercise and stimulation to keep mind and body sharp. Caring for the senior equine is very rewarding for most horse owners. After years of work and play, the older horse deserves attention and care. Although there is some controversy as to when a horse becomes a senior---some say after age 15 and others say after age 20 because of the extended lives of horses today-- a little care can ensure that the horse has many serviceable years left. Older horses are less energetic and more restricted in their scope of activities and this needs to be taken into consideration in their care. Younger, more aggressive horses often displace the older horse when it comes to feeding and if this happens, the older horse should be fed separately. 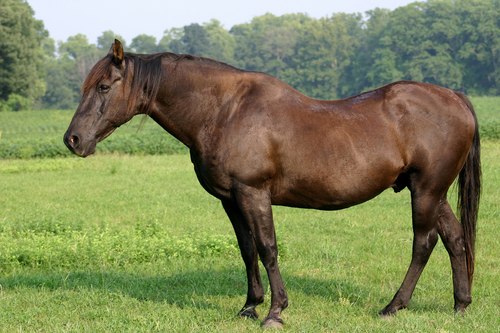 Aged horses don't tolerate change well and, if possible, the older horse should be kept in familiar surroundings and should not be boarded out or hospitalized if at all possible. An older horse makes a good companion for foals and other horses and for people who don't feel the need to "ride with the wind." Provided with the easy-to-eat hay or pasture and regular exercise to keep muscles and joints from stiffening, older horses can continue to enjoy and give enjoyment. Pleasure horses continue to work until well into their 20's and are often known for their quiet gentleness when around children or younger riders, although some older horses show displeasure at having to work, especially when they don't feel on top of their game. Older horses need to have their teeth checked frequently, at least twice a year since pain from overgrown teeth can cause a horse to lose condition quickly. In cases where horses have missing teeth, easy-to-chew feeds may need to be provided. Fortunately there are many 'senior' formula feeds on the market. In addition to adequate feed, good dental care, and regular exercise, your veterinarian may recommend supplements such as glucosamine, chondroitin, or hyaluronic acid to help an older horse stay limber and comfortable. Shelter from wind, wet, and cold weather becomes even more important as a horse ages. Your older horse may be more comfortable in a warm winter turn-out blanket when temperatures go below 50 degrees. Careful monitoring of the older horse's condition is necessary to avoid or treat problems before they become life threatening. An older horse makes a good companion for foals and other horses and for people who don't feel the need to "ride with the wind." A properly trained and well-treated horse usually grows more mellow and accepting with age, and as long as the horse is healthy and relatively pain-free, it will continue to bring joy to those around it.